Using Relativity to magnify stargazing — Two teams of scientists report seeing single, twinkling stars in galaxies billions of light years away with the help of the Hubble Space Telescope. All they needed was Albert Einstein’s theory of general relativity. ~ And I thought that theory was about my Uncle Eddie. Milky Way centre has loads of black holes — The supermassive black hole lurking at the center of our galaxy appears to have a lot of company, according to a new study that suggests the monster is surrounded by about 10,000 other black holes. The first 3d-printed steel bridge looks like it broke off an alien mothership — MX3D in Amsterdam just revealed the world’s first 3D-printed bridge. 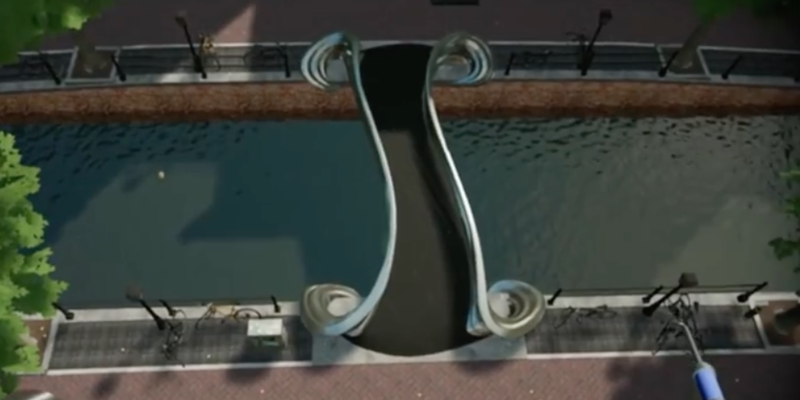 It’s made of a completely new type of steel, spans 12.19m (main picture, above), and will be installed early next year in De Wallen, the largest and best-known red-light district in Amsterdam. It also looks utterly otherworldly. ~ The pimps and pushers will be pleased. Antarctic vegetables — As temperatures outside dipped to well below freezing, and as blizzards pounded the Antarctic research station, German scientists were carefully tending to a remarkable veggie garden – one requiring no soil or natural sunlight. The success of their first harvest, which produced vibrant-looking lettuce, radishes, cucumbers and other treats, represents a promising test run for similar greenhouses that could one day be built on Mars – or beyond. Archaeologists have now found ‘new’ Nazca lines with the help of drones — Peruvian archaeologists armed with drones have discovered more than 50 new examples of these mysterious desert monuments in adjacent Palpa province, traced onto the earth’s surface in lines almost too fine to see with the human eye. In addition, archaeologists surveyed locally known geoglyphs with drones for the first time – mapping them in never-before-seen detail. Roman refrigerators — Archaeologists in Switzerland are conducting an experiment to figure out how ancient Romans used a series of deep shafts to keep food cool well into the summer months. The shafts were discovered in 2013 at Augusta Raurica, an archaeological site located near the Swiss city of Basel. The Roman colony was founded in 15 BC, and it soon blossomed into a vibrant metropolis and trade hub that was home to around 15,000 to 20,000 people. Today, Augusta Raurica remains one of the best-preserved Roman cities north of the Swiss Alps. ~ Really? To get cold in Switzerland, just walk up hill! Four-eyed lizard — An ancient species of monitor lizard that went extinct some 34 million years ago had four eyes, according to new research. It’s the first time that scientists have ever seen such a thing in a jawed terrestrial animal – an observation that’s filling a gap in our understanding of how these features evolved. ~ Ah, but was four-eyed forewarned? But have you been in Switzerland in summer–it can be intensely hot for days and nights at a time. Also the Iranians used to collect water in the desert, and even make ice cream by their ingenious knowledge of how to construct small barriers for getting the water having figured out how to make ice from it. They also cool their houses, still many to this day I believe, by collecting wind from ‘chimneys’ and the air goes underground over water under their houses and is expelled up another chimney to make an air conditioning system.